Russell Hoban was a singular writer; when asked what kind of a writing I do, I have generally offered up Hoban as the “genre” in which I write. Sadly, his name didn’t always resonate with people — and that includes NY Times obit writers; though most memorials mentioned Riddley Walker, too many seemed to be speaking of his masterpiece second hand. While many of Hoban’s works deserve the accolade of ‘masterpiece’ this is the one that resonated most deeply for me. I read Riddley first in high school around the time I also read A Clockwork Orange: these books cemented my love of languages in a fictional context, though when I re-read Riddley as an adult, it was as if I had never read it before. Becoming a medievalist brought a further level of amazement, and visiting Canterbury Cathedral to see the St. Eustace painting was the ultimate pilgrimage for me. Along with the art of “being friends with your head” Hoban’s books taught me to trust in my muse and just write the stories I had to tell and trust that somewhere out there might be readers who would find resonance with them (and that they wouldn’t do so if I didn’t write them). Fans of Hoban might not be as numerous as those of more popular writers, but my experiences with the Kraken show me they are extraordinary and devoted. My obsessions with storytelling and ritual feature here. 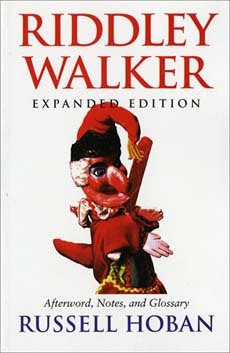 The essay originally appeared in Puppetry International back in 2006, one of the first academic essays of mine to appear in a non-academic publication that I nonetheless listed on my CV. At the time it seemed a bit radical (is it peer reviewed?!) however since then I have continued my slide into publishing with abandon wherever my words might be of interest. No regrets there. I suppose I could blame tenure, but I only got that last year, so I suppose it’s just my lax attitude. (>_<) I recommend picking up the issue of PI if you have any interest in puppetry: fascinating publication. I think there’s more I have to write about puppets, even more about Punch, but things leak out of my brain at their own pace. Here’s the opening: I’ve put the rest up on Scribd (restoring my original title which I prefer). Be sure to see Todd’s round-up of this week’s Forgotten Books (Pattii’s taking a break for the holidays).